‘…the miners, their machinery, and their buildings have gone; but in the hill the great open cut gapes like a crater…’ – from Don John of Balaclava by Miles Lewis 1977. The ghost town of Whroo, Victoria, is an abandoned attraction in an abandoned ghost town built at an abandoned gold mine. Two sailors – John Thomas Lewis and James Meek Nickinson discovered a gold nugget in the grass at Whroo in 1854, the same date as Russia’s Battle of Balaklava in the Crimean War, hence the name. A gold mine was quickly opened and was very profitable for the first few decades, leading to the development of the town of Whroo. The mine then operated on and off and officially closed in the 1960s. In the 1980s attempts were made to protect the site as a historic landmark. Sadly, little remains of the former town. 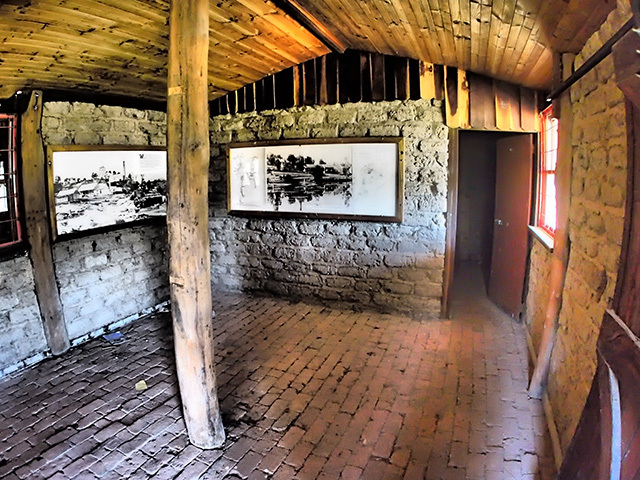 Near the dusty parking lot at the Whroo historical site are two small buildings. A Lonely Planet listing informed us that ‘Whroo visitors centre has a café and a newly produced DVD and history book for sale’, though when we arrived we found that the visitor’s centre (below) is now little more than a plaque on an empty shack holding two faded sepia photos of the area nailed to the walls. Next to this visitors centre is another small building, formerly a church, with a For Sale sign on the sealed doors. The same locked door bears a faded sign warning tourists against entering the mine due to ‘current conditions’ and from the look of the sign, I can’t say just how current that warning is. At the entry to the open cut mine, tattered remnants of an orange plastic barrier flapped in the breeze. Similarly, a bundle of orange plastic sat on the dusty ground just outside the tunnel entrance. Needless to say, it was hardly a deterrent. 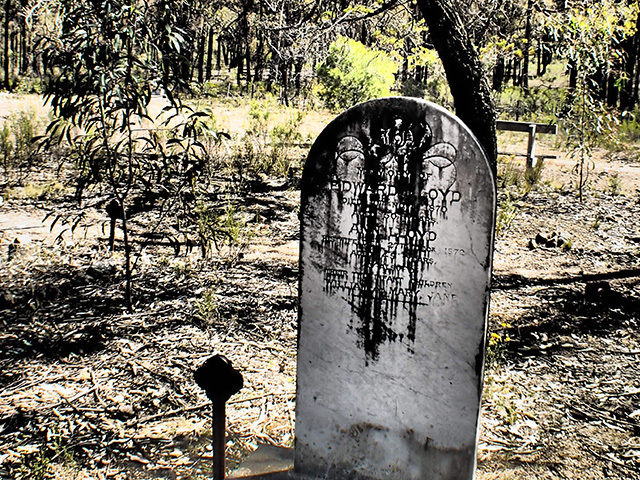 The nearby Whroo cemetery includes some beautiful, dilapidated headstones, and is perhaps most haunting for its numerous unmarked graves. Indications are that about 400 residents were buried here, and of the graves with headstones, the epitaphs tell of a harsh life lived at Whroo. A walk through Whroo cemetery and the abandoned mining tunnel is well worth the trip, but don’t expect a cup of coffee at the visitor’s centre. This is a true ghost town – it’s only a shame that nothing more remains of the 130 buildings that once stood here in the hey day of Victoria’s gold rush. I want a headstone like that. Headstones today are just too shiny, I can’t imagine them ever getting that authentic look. Did you actually take any photos of the “former” church? Was it an old bluestone? Really love those quaint little old churches. The tiny former church is a humble rectangular red brick structure. One wooden door is quite charming but I don’t think the rest is original. It was the ‘cafe’ mentioned in the (clearly outdated) Lonely Planet listing and there isn’t much to it, sadly. It is for sale. 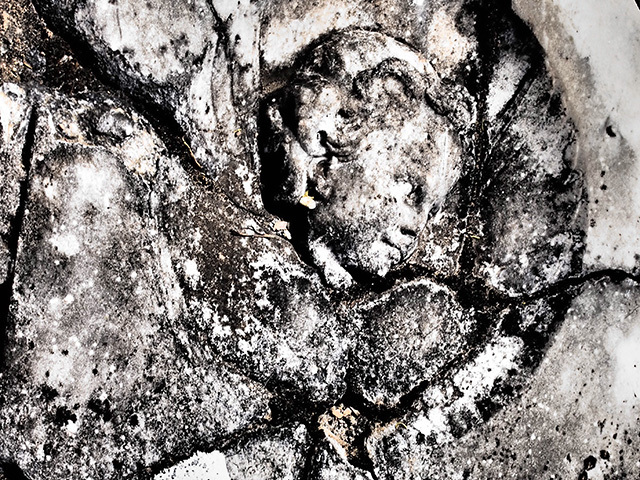 Dripping yogurt over a stone sculpture – or headstone – can give it some of that streaky aged look. We dumped a tub of yogurt on our resident gargoyle and he looks quite fetching. the mines and the surrounding bush land is very beautiful, many great photo can be taken if you spend some time going down the bush tracks. the mine its self can be dangerous if ya not careful, but everything is fenced off safely. the ex cafe info centre was built on the old church site and the doors were put on the building from the old church. anyway if your ever travelling between shepparton and bendigo its worth a look at the area even just too see the iron bark forest. I lived in shepparton for a short while, almost 11 years ago. Taking a drive to the old mining site of Whroo was an historic delight. The old cemetery was fascinating, as it gave a glimpse into a bygone era. We’re planning an epic Western inspired Fashion Film and editorial, and looking for a suitable location in Victoria. We have some ideas which we are going to check out tomorrow. As a former model, how was the backdrop of Whroo? Worth checking out? Wow – Tara Moss knows about Whroo ! We are descendants from Whroo locals on our Dad’s side … they ran the Inn and the Store … i love the fact it disappeared back into the bush, and that everything, even the buildings, were recycled. 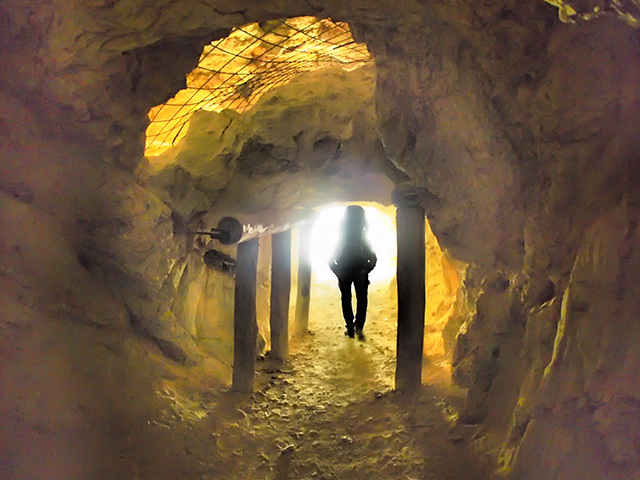 Thankyou for this wonderful glimpse into Whroo’s history and particularly for the pics inside the old Balaclava mine. My great-great-grandmother is buried in one of the unmarked graves at Whroo cemetery and your article has inspired me to go back for another visit. It has always amazed me that the whole town just disappeared once the gold was gone. When I was there in the mid 90s I found a lot of information at the nearby Rushworth Historical Museum. Thanks again. Went to Whroo 9th Jan 2014. Lovely place as always from 20 years ago. Still got Balaclava open although visitors center is still up for sale. Although most routes are blocked. Plenty of open cut sites left…..be careful…LOL. Found two quartz blocks the locals didn’t grab with two veins in them. Still such a historic site loved every minute with the kids and the missus……However, still plenty of mines around the area but most are on private land closer to Rushworth. I found this site after visiting the Australian War Memorial in Canberra. My wife had a great, great uncle (Ambrose Allen) who was killed in WW I in Belgium. The records show that he was from Whroo, Victoria, a town I had never heard of before. I found your story of The Ghost Town of Whroo intriguing given that Ambrose Allen was listed as a ‘tunneller’ and that Whroo’s origins were in gold mining. Whroo is a place I frequently visit when I come up to Nagambie from Melbourne, have done so all my life and was up there this weekend. The tunnel from the bottom of the open cut mine to the other end has recently been closed off. I’ve been told due to people trying to Digg there for gold, has made that area unstable. Have been down some of the mines but not very far. Planning on a ‘full on’ ropes and harness trip down there soon. I believe I may have met you in the Rushworth Historical Society whilst you were doing research. With regard to the Visitors’ Centre, it was and still is, privately owned. It was operated efficiently for a number of years – and is actually on private land (a fact not well known). However, the owner – who has lived in this area for a lot of years – fell and suffered an injury to her back which has rendered her incapable of operating the facility. A great pity because the lady developed it to the extent that it was a real asset. She is also a very knowledgeable historian. The old puddling machine and the well that is out at whroo was my grandmothers. she used to live out there when she was little. i am happy to answer any questions you have about it. To Robert Spinks, I have some information on the Berrys. To contact me, see below. Would be keen to communicate with Ruth Williams, above. Interested to learn whether her family hotel was also the Inn owned at one time by Neilsen, or whether they were separate establishments. Ruth may not see this. If any reader knows her, could they please ask her to call me on 0412 143660. Does anyone know the name of the family that lived in the homestead?? It’s obviously not there now, but I remember visiting when I was younger and reading a sign about the only thing remaining of the homestead was the four trees that were planted at each corner. It’s something I’ve never forgotten and have always been curious about. A great place i visited here last year and also visited the nearby aboriginal carved waterholes that no one knows about anymore such a great place and said that its forgotten. And today to hear a body has been foubd in the open cut mine too. I hope this sad fact makes more aware of it and brings people to discover this amazing place. This area is more than what you have talked about in the article you have written. I grewup in Rushworth a near by town, as for the headstones, possibly having yoghurt poured over them, they were in the same state the last time I was there. Did you by any chance visit the battry dam, or the puddling pit, or did you take notice of the head stone that reads…. Look at me as you pass by as you are now so once was I, as I am now soon you will be, prepare yourself to follow me. I used to ride my horse all around tge state forest of Rushworth and Whroo and there is so much more than you describe. When next you visit a place like this maybe ask a local about the other treasures that exist. I would love to hear the full and accurate wording on the headstone you have quoted – I did see the headstone many years ago and the words left a lasting impression on my mind. Unfortunately I cannot remember them exactly. Can you assist, perhaps even a photo of the headstone? The township of Whroo has, for a very great many years, been nothing more than the name of a dot on a map. A surveyors map of the town from long ago shows churches, schools plus a great many housing plots, many of these outlines bearing the the name of the original property owners. However, having a name within a pen-drawn outline did not declare that a church, school or residence was ever actually built. As well, so many numbers of people declared to reside in ‘we’ll give it a try’ places actually only tried for a brief time before discovering that seeking a quick fortune was harder than expected. The nearby goldrush town of Rushworth has been said to have had a population of forty thousand but there could not have been more than a couple of hundred on any given day – if only because of the lack of water in the area (the Waranga Basin did not even begin to exist until over half a century after the gold rush:1903). There may have been a great many miner’s licenses issued but very few actually did any digging for longer than a fortnight. Many of these old Australian ‘ghost towns’ bring one’s imagination into play, imagining what it may have been like ‘back then’. An example of a ‘ghost town’ actually evolving into a ghost town today can been seen in the nearby town of Rushworth – I so hope that everything is being suitably recorded for later historians! Dear David Willmann, you will be pleased to hear that your great grandfather’s grave is still under the care of a Whroo graves group who gives attention to this graveyard permanently. Your information regarding the Darroch family would be be gratefully received by Mike Wellington (he has an entry above) at rushworthfestival@gmail.com or via the Waranga News, Rushworth or the Rushworth Historical Society either of which may put you in contact as needed. Information of this kind is precious. Alan Mclean .. I may have gotten the pub/hotel location wrong regarding ancestors .. They are in that little book produced by the Whroo group .. I’ll text you when hav checked w historicall accurate sister ! We recently travelled to the Cemetery to visit my great grandfather’s grave – Frederick Stock. Would love to find out more about the Stock and Dalcam families.